While I am an unabashed lover of pizza, I tend to be a purist when it comes to my favorite food. I’m more or less addicted to my marinara recipe and think it is the ideal base for a building any pie. A recent freelance assignment challenged me to craft a pizza fit for the fall season and I found myself playing with brussels sprouts and bacon, realizing that a tomato sauce would not allow these ingredients to fully express themselves. The crust would need a healthy dose of cream, infused and enhanced with garlic and rosemary. 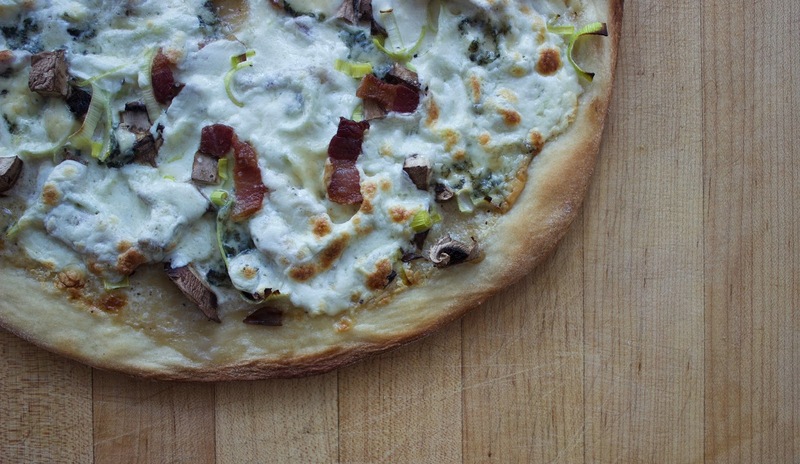 After several test runs I was officially a white-pizza convert, the richness and comfort-inducing qualities of the bubbling cream a quintessential partner for the bacon and brussels sprouts. 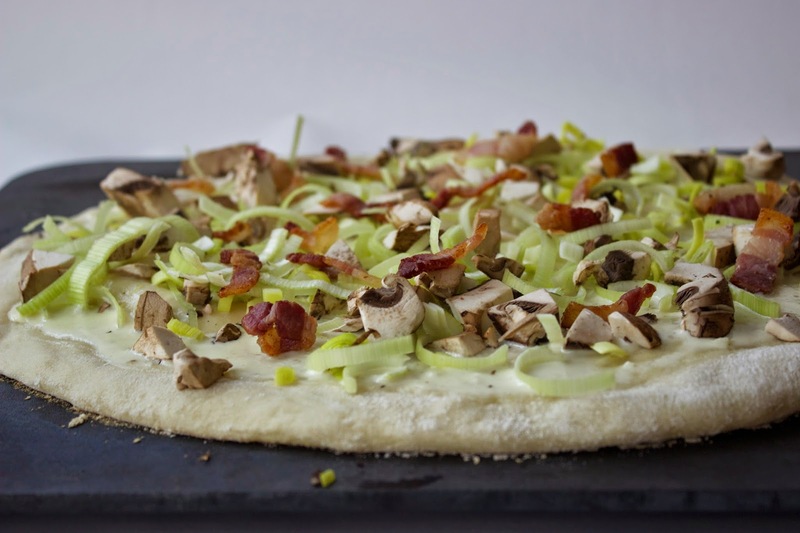 This pizza takes that same creamy base and tops it with earthy mushrooms and delicate leeks, both charring perfectly in the blistering hot oven, mozzarella and blue cheese melting alongside while slivers of bacon crisp and brown. It is decadent and familiar, a warm embrace of fall to help take the edge off these cool, pre-winter nights. A pizza is only as good as it’s crust and I happen to really like my dough recipe. To begin, place one and one thirds cup very hot tap water in the bowl of a stand mixer. Add one packet of active dry yeast to the water along with one tbs of sugar. Mix with your hand so that the sugar dissolves and then allow to sit at room temperature for ten minutes. The yeast will activate (also known as ‘proofing’) and bubbles will form on the water. Sift three and three quarter cups all purpose flower directly into the yeast mixture along with one tbs table salt. Add two tbs olive oil to the bowl. Using the dough hook, mix the flour and yeast on low speed for three to five minutes until well blended and you can see the dough begin to come together. Roll the dough out onto a clean surface and knead with your hands for an additional four to five minutes until the dough ball becomes smooth and elastic. Drizzle one tbs of olive oil into a large bowl and place the dough ball into the bowl. Turn the ball around and flip it over, ensuring all sides are covered with the oil. Cover with saran wrap and allow to rest at room temperature for one to one and one half hours. Once the dough has doubled in size, roll it out onto the counter and cut it in half. This recipe yields two 12″ pizzas. The dough balls may be frozen at this point, if you prefer. If using that same day, allow the individual dough ball to rest for an additional 15 minutes before rolling out into the crust. Another key piece to a fantastic pizza is how you bake the crust. I put my pizza stone on the baking rack and I crank my oven up to 500 degrees (you want to be sure your oven is very clean to heat it this high). Allow the oven to preheat and warm at 500 for one hour so that the stone is flaming hot when it’s time to bake the pizza. While the pizza dough is resting prep the toppings. Slice two pieces of bacon into quarter-inch strips. 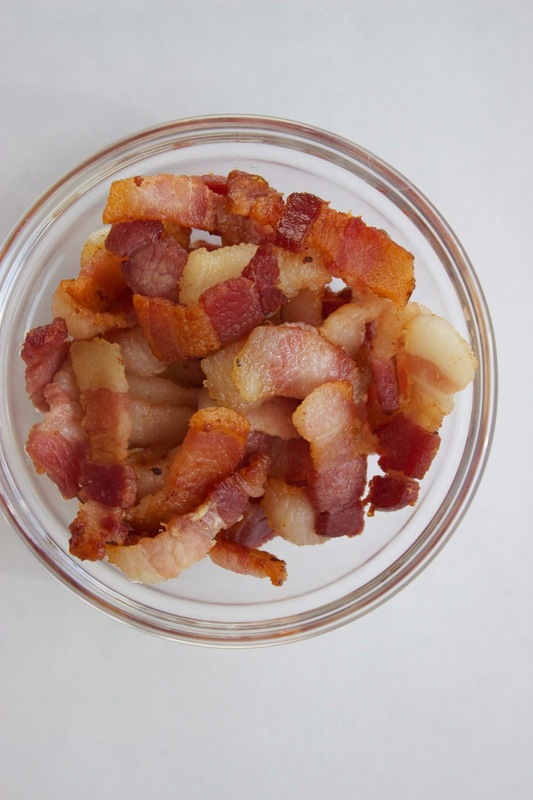 Sauté the bacon in one tsp of olive oil until the fat is rendered and it is just beginning to crisp but is not fully cooked. Remove to a plate lined with a paper towel and set aside. Roughly chop enough baby portobello mushrooms to fill three quarters of a cup. Slice the root end from one leek and split length-wise. Rinse thoroughly under cold running water, pulling the layers apart to make sure all of the sand is removed. Slice thinly. Set aside. Time for the sauce! Pour one cup of heavy cream into a small sauté pan. Add two cloves garlic, minced, one half tsp kosher salt, one quarter freshly ground black pepper and one stem rosemary. Stir to combine and bring to a low simmer. Stir frequently, allowing the cream to reduce and thicken for ten minutes. Make sure to keep the heat low so that the cream doesn’t burn. 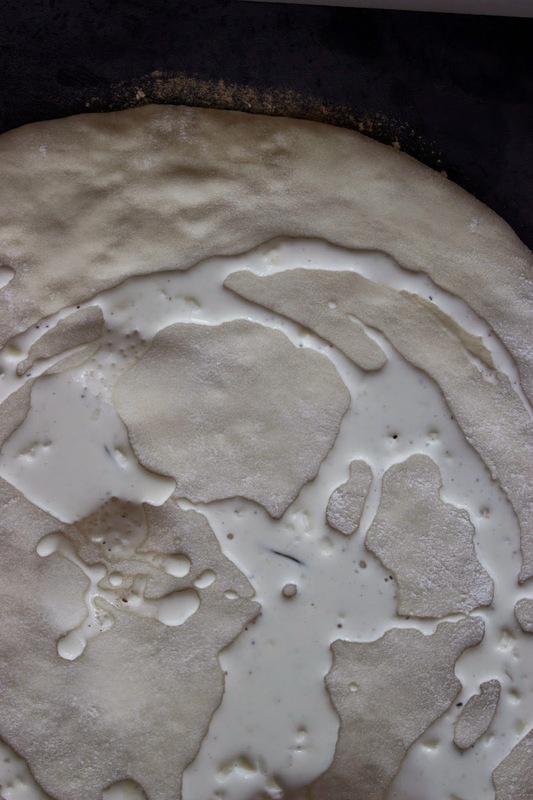 I nearly always use whole mozzarella, sliced thinly for my pizzas. 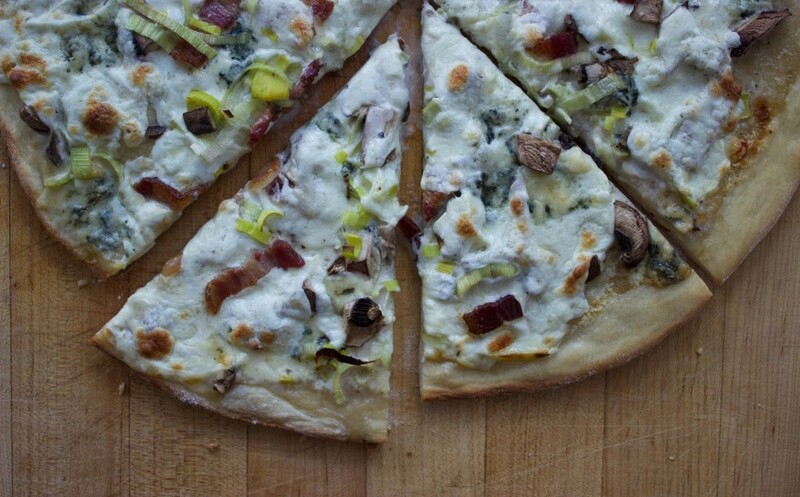 I added crumbled bleu cheese to the mix as it makes great friends with the mushrooms, bacon and leeks. 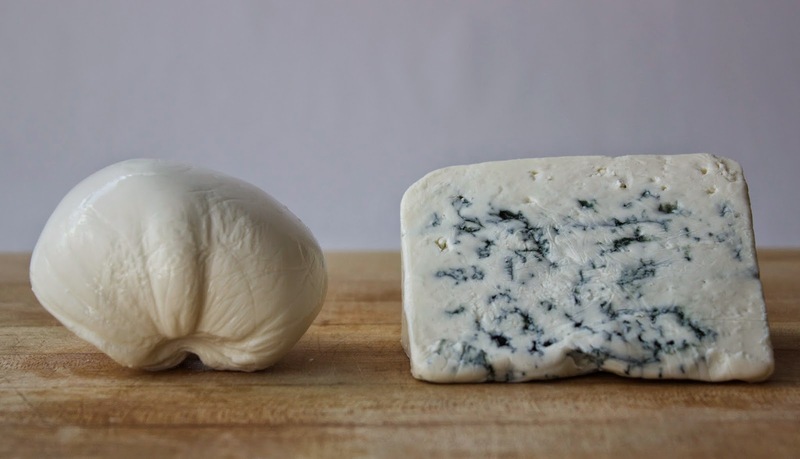 Slice the mozzarella and set aside. It’s time to build our pie! Liberally flour your counter so that the dough will not stick when you are rolling it out. 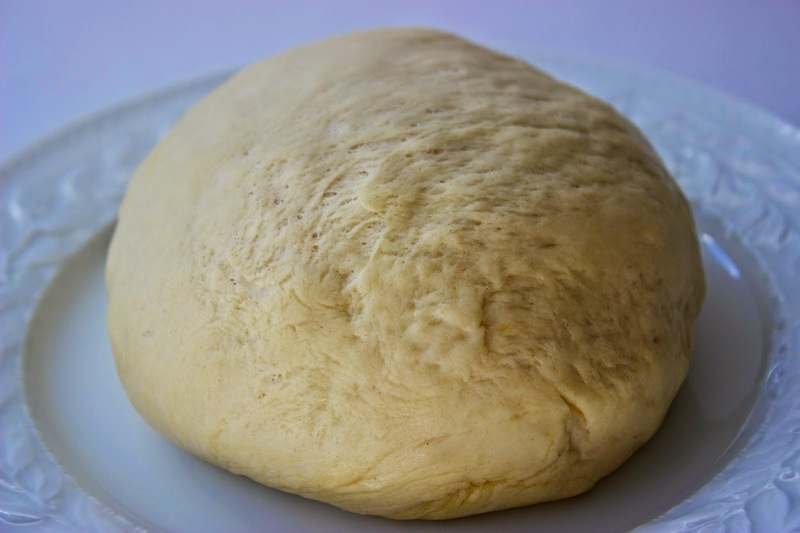 Flour your rolling pin as well and begin to carefully form the dough ball into a thin, round pizza crust, approximately one quarter inch thick and twelve inches in diameter. If you have a pizza peel feel free to add the toppings to your pizza here and then transfer it to the pizza stone. 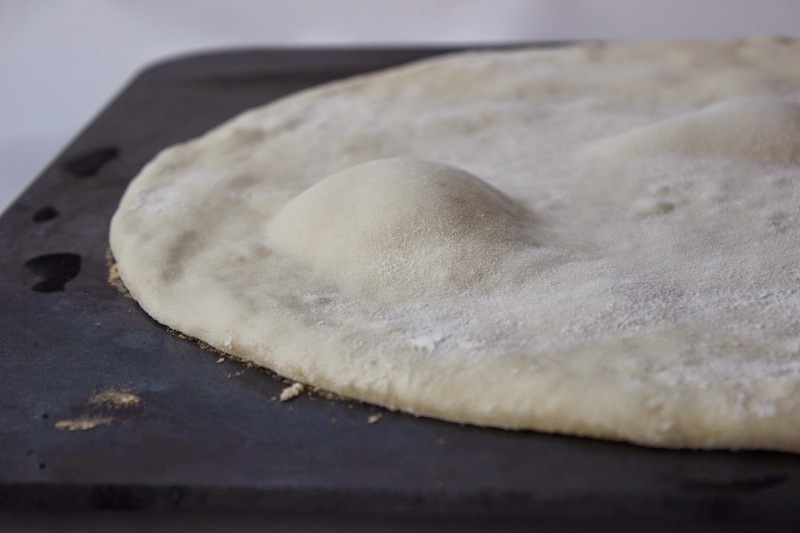 I prefer to roll the dough around my rolling pin and then to unroll it onto the pizza stone, which I’ve removed from the oven to the top of my stove. The dough will quickly begin to bubble and puff up on the hot surface. 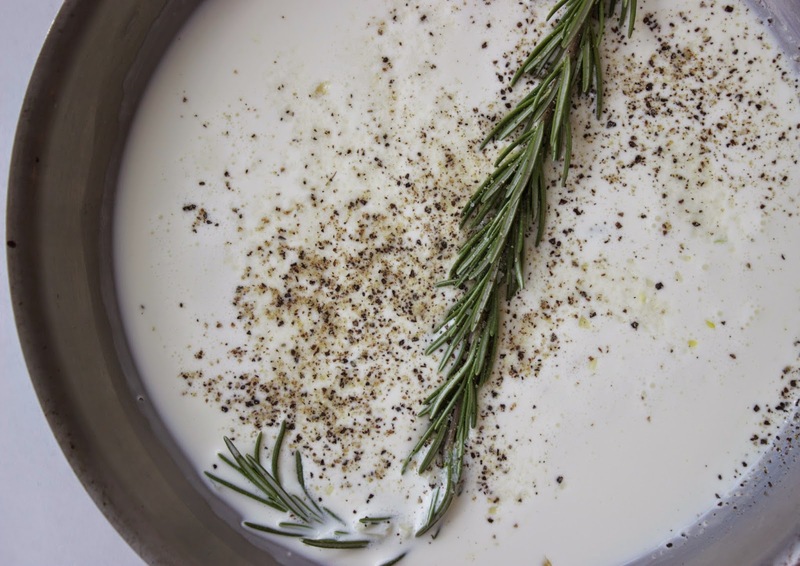 Spoon the garlic and rosemary infused cream onto the crust and spread into an even layer. 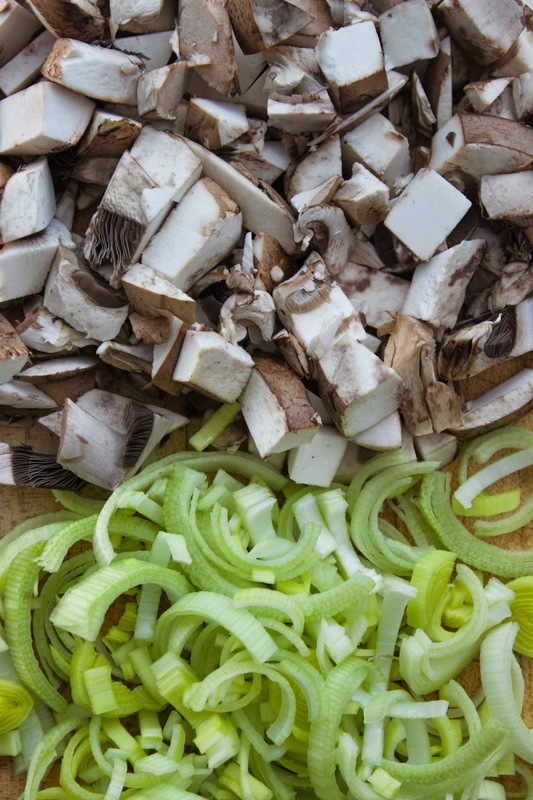 Top with half of the mushrooms and leeks. Add half of the bacon to the top of the pie. Place the slices of mozzarella in an even layer over top of the pizza. 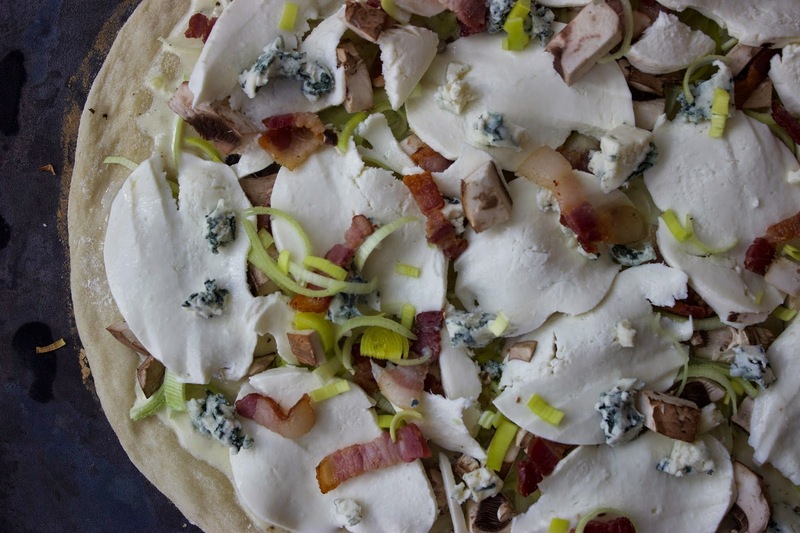 Sprinkle with bleu cheese and remaining leeks, mushrooms and bacon. Add a pinch of kosher salt over top of the pizza – no more than a quarter tsp. While the bacon and cream sauce offer plenty of saltiness, the veggies have not been seasoned and the mozzarella always responds nicely to a little bit of salt. Bake for eight to ten minutes until the cheese is brown and bubbly. Remove from the oven and allow to rest for three minutes before slicing. Enjoy! Spoon the garlic and rosemary infused cream onto the crust and spread into an even layer. 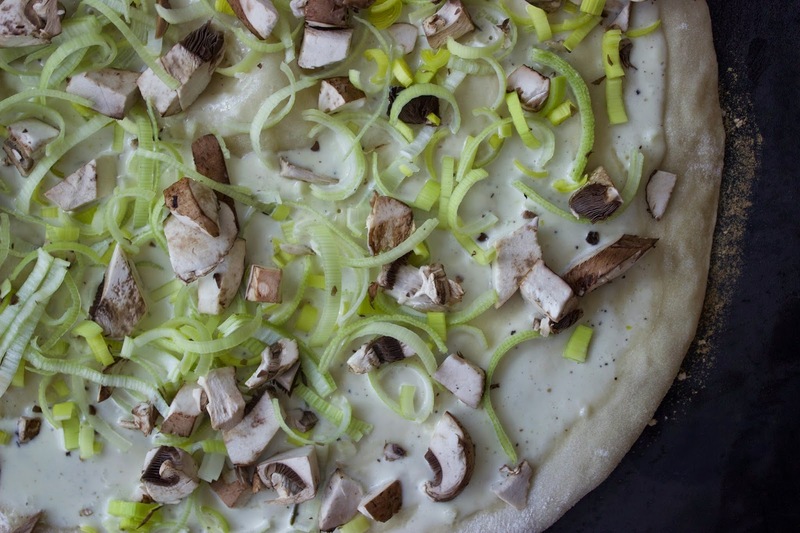 Top with half of the mushrooms and leeks. Add half of the bacon to the top of the pie.